Skyland İstanbul 1 is the tallest building in Istanbul and the 7th-tallest building in Europe. A night view of the skyline of Istanbul. Istanbul is the largest and the capital city of Turkey. It is the country’s economic and political center. Istanbul has a number of the tall buildings that not only dominates Europe’s skyline but also the entire world. As of November 2017, Istanbul has over 269 high-rise buildings that are at least 100 meters tall, ranking Istanbul as the second city with the highest number of skyscrapers that are at least 100 meters tall in Europe. This article explore some of Istanbul’s tallest building, their location, height, construction, and other features of interest. The tallest building in Istanbul is the Skyland Office.The building is 932 feet tall and has a total of 65 floors. The construction of the Skyland Office Tower started in 2013 and was completed in 2017. Eroglu Property is credited with the development of this building. The tower majorly hosts commercial offices and to a lesser extent, it is used as a car park and a shopping center. Skyland Residence Istanbul is the joint tallest building, having the same height as the neighboring Skyland Office Istanbul. Both buildings rise to a height of 932 feet. Skyland residence has a total of 64 floors above the ground, one floor less than Skyland Office. Its construction was completed in 2017. The skyscraper hosts luxurious residential apartments. The residential units have outdoor and indoor swimming pools, spas and wellness centers, and smart home technology. The house units offer a panoramic view of the city. The third tallest skyscraper in Istanbul is the Metropol Istanbul, located in East Atehesir District. The building is 919 feet tall and has 58 floors. Its construction began in 2013 and was completed in 2017. 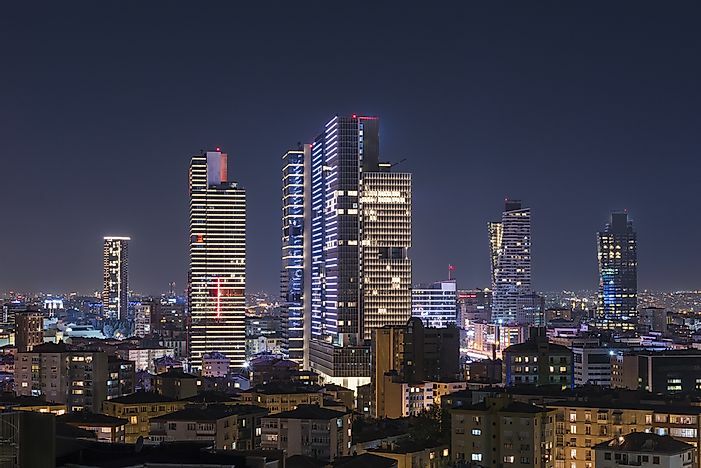 Metropol Istanbul hosts a number of facilities including one of the largest and most prestigious shopping malls in the city, home offices, learning institutions, recreational centers, and residential units. Istanbul Sapphire is the fourth tallest skyscraper in the Istanbul at 856 feet, including the aerial at the top.It is located in the Central Business District of Levent. The building was constructed between 2006 and 2010. The official opening ceremony of Istanbul Sapphire was held on March 4, 2011. The building has a total of 66 floors of which 12 floors are underground underground. Istanbul Sapphire is mainly used as a public shopping center, a lavish residential tower block, a restaurant, golf club, a public observation terrace and a car park. The property is managed by Kiler GYO. Since the dawn of the 21st century, there has been a significant increase in the number of skyscrapers in Istanbul. Each year new skyscraper is built, completed, or planned for. The new buildings often become the tallest building in the city. For instance, Istanbul Sapphire was the tallest building until the three buildings; Skyland Office Istanbul, Skyland Residence Istanbul, and Metropol Istanbul were completed in 2017. The first skyscraper in the country was constructed in 1968. Since then the city has never looked back. Today, the government is considering pulling down some skyscrapers to protect the historic view of some of the key buildings. Which Continent is Istanbul In?